The study of the moon and lunar origin has fascinated man since the time of Stonehenge. Where did the Moon come from? People from many scientific fields have weighed in on the subject through the ages. It was hoped that the Apollo missions would finally answer this long standing mystery. But alas the failure to confirm a lunar origin model may have been the greatest scientific disappointment of the Apollo effort. 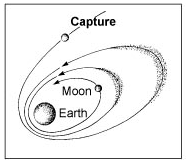 There are four major categories of lunar origin models: the binary model, fission model, collision model, and capture model. The binary model, in some respects, is the simplest and least problematic lunar origin model and thus is usually considered the default model. Binary formation is what would be “expected” in standard solar system formation models, with the moon forming as part of the earth’s nebular cloud. Satellites which originate in this manner are called regular satellites. Satellites which have unusual orbits, typified by a moon which orbits its planet in a direction opposite to the planet’s direction of rotation or “backwards,” are considered irregular satellites. The binary model does not require any “special circumstance” for the formation of the moon; the earth and moon simply formed together out of the same cloud of primordial material. The situation of the earth-moon system however, is generally believed to be unique. This is why the other three models (the fission model, collision model, and capture model) have been developed to answer some of these unique conditions of the earth-moon system. 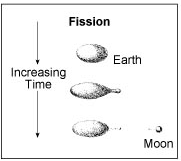 The fission model was the model often taught in grade school during the Apollo era. Interestingly, at the time of Apollo, it was still taught that the Pacific Ocean was formed by the fission of the moon from the earth’s crust. The model of plate tectonics was still a hypothesis while man was walking on the moon. The fission model was first presented by George Darwin, the son of Charles Darwin. This was really the first scientific and comprehensive model developed to explain the origin of the moon. Darwin’s work was done on rapidly spinning viscous bodies. He calculated that the earth would have about a 2.5 hour day in order to have the centrifugal force to spin the moon off. It was later determined that the fission model is not dynamically possible for two major reasons. First, the bulge at the earth’s equator which ultimately would form, and be flung off, would cause instability in the earth’s spin leading to a slowing of the earth’s spin. The collision model, developed in the 1980s, originally had the same main objective as the fission model; to explain the observed similarity in density of the earth’s outer mantle and the moon. The original idea was that the moon formed as a result of a collision between the proto-earth and another free roaming planetary body in the very early days of the solar system. The similarity in the density between the moon and the earth’s mantle had long attracted scientific interest. In the beginning it was thought that the collision model would account for this similarity in density, just as it had been thought that the fission of the earth’s mantle would account for the similarity. 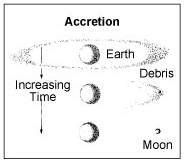 Ironically, further investigation led to the understanding that in the case of collision, the moon would actually be composed primarily of the impacting proto-moon, not the proto-earth material. 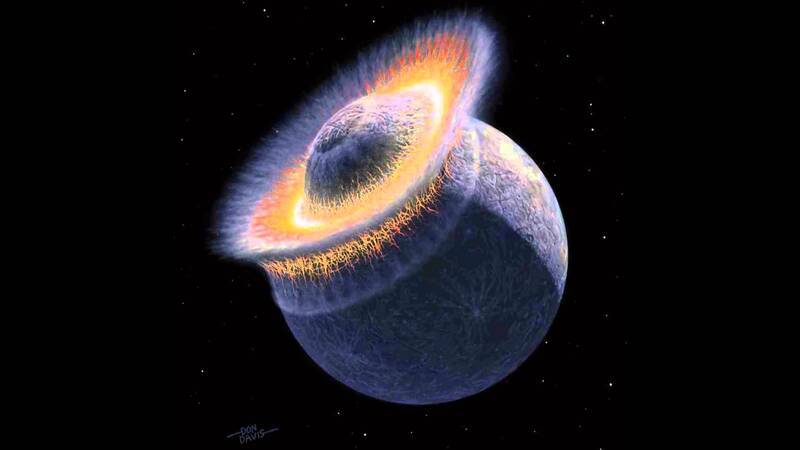 A strong selling point of the collision model is that computer simulation of a proto-moon impact into the earth can produce the desirable outcome of creation of a moon; though these simulations are quite simple approximations of reality. A potential problem with the collision model results from the finding that in order to generate a Moon such as ours in a collision origin, the initial proto-spin of the earth must have been around 2.5 hours. The rapid spin rate would have to have slowed to our current 24 hour day, and this may be difficult to achieve. This same result was a blow to Darwin’s fission model and must be dealt with in proving the collision model. Another interesting piece of evidence is that the moon may have water on it. The moon, it had been thought, lacked any water bearing minerals. 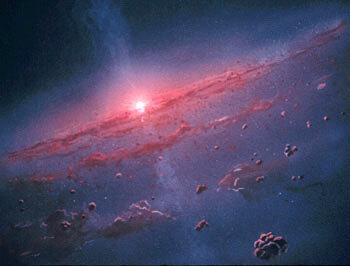 This Apollo age belief seemed at odds with the collision model given the aqueous nature of Earth, with its modern oceans. 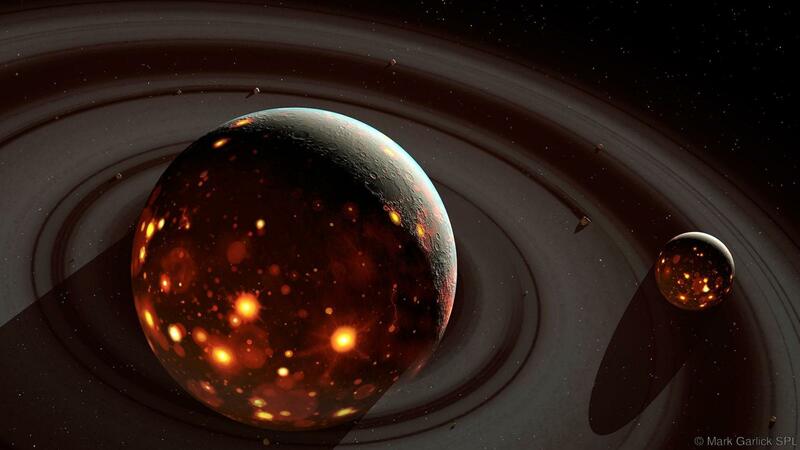 How a dry moon formed from a wet planet was a continuing question. But recent evidence now seems to suggest that water may exist on the moon. The capture model was a favorite model during the Apollo age. The greatest difficulty with the capture model is the dynamics of the capture event itself. This event is typically imagined as a freely moving moon nearing the earth and the gravitational power of the earth, literally slowing the moon to the point that it becomes permanently “captured” into a geocentric or earth centered orbit. The difficulty with this proposition is primarily the relative size of the moon compared with the earth. The kinetic energy of the moon, which would be required to be dissipated, in order to slow the moon down and facilitate a captured moon, is immense. It is felt that the capture event window would be too brief to allow this amount of energy to be dissipated from the lunar motion. One solution to this slowing problem was what is called the gas drag model. In this capture variation it was postulated that the early earth was enveloped in a thick gas cloud which would contribute to the slowing of the moon as it approached the earth. Even with this added dissipation mechanism, capture was still found to be too energetic of a process to be very likely. It is important to recognize that during the Apollo age the concept of tidal heating in the solar system was just beginning to be understood. It had previously been postulated that perhaps both the lunar flood basalts and earth’s own flood basalts had been caused by a capture event. But the whole understanding of how this heating worked was still very theoretical. Had there been recognition of tidal heating’s potential and the quantities of heat needed to make capture work, the capture model may have been looked at more closely. Another major problem with the capture model was thought to be that oxygen isotope evidence proved a similar place of origin for the earth-moon system in the solar nebula. This was seen as conclusive evidence that the capture model was not the correct model. This oxygen isotope evidence has since been found to be unrelated to the origin argument. Thus what was once thought to be one of the few strikes against capture was later found not to be important. 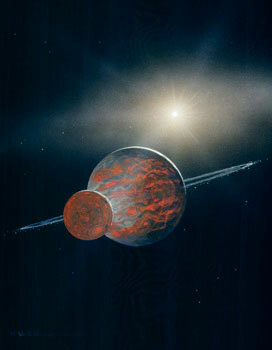 To be clear, a capture at the time of origin of the earth-moon system would have involved tidal heating. However, this is an entirely different and unrelated event than the tidal heating described by this new model. The Close Approach Lunar Model (CALM) is a secondary heating event, which happened billions of years after the origin of the solar system and is independent of any lunar formation model. The several models for the formation of the earth-moon system that have been carefully delineated by scientists over the past hundred years are all “origin” models. The model presented here, the Close Approach Lunar Model, is not a new “origin model” but instead is an insertion of an additional and much later “event” into the history of the earth-moon system. This close approach event could have followed any of the accepted origin models. This secondary close lunar approach event, however, has significantly contributed to the history of the earth-moon system. It will be shown that evidence for this event is wide spread on both the earth and moon.